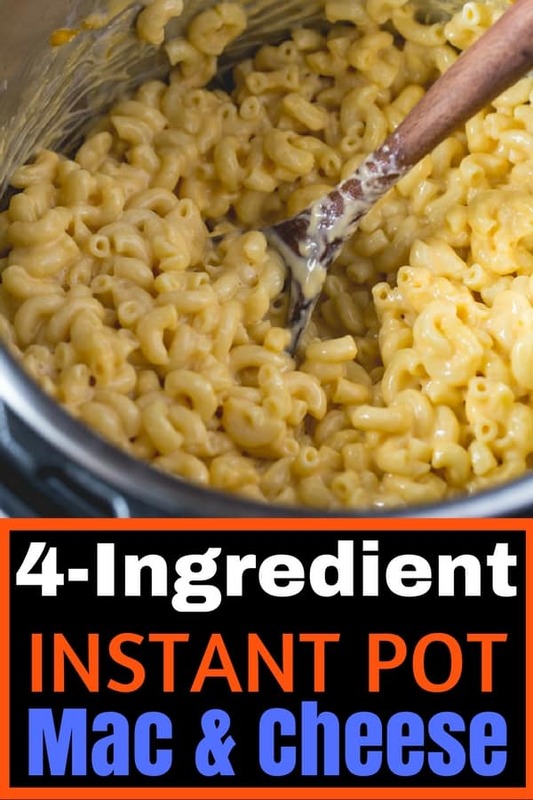 Instant Pot Mac and Cheese only requires four ingredients: pasta, butter, evaporated milk, and Cheddar cheese–lots of it. In only minutes, you get a creamy, perfect mac and cheese. Who needs another recipe for mac and cheese? Me, that’s who. My first attempt at Instant Pot Mac and Cheese is delicious. It’s also a little…putzy. The recipe uses an egg, mustard, and hot sauce along with a good addition of cheese. It makes a delicious, and decidedly grown-up, mac and cheese. For this version, I wanted something simple. The type of mac and cheese that defines classic American comfort food—a creamy pasta with no sharp edges from mustard or pepper. Basically, I craved a homemade version of Stouffer’s mac and cheese. After working on it for a bit and eating too much mac and cheese. (Read: I wore stretchy pants a lot. ), I came up with a recipe that uses only four ingredients. (I’m not counting water or salt.) That’s right, you don’t need a ton of ingredients to make a creamy, dreamy mac and cheese in your instant pot. So get your stretchy pants ready, this recipe is a comfort food miracle. Use Elbow Macaroni. It cooks in only four minutes and doesn’t get mushy. To prevent starch from shooting out of the valve when releasing pressure, add butter during cooking. The fat helps keeps the foam down. Stir in Evaporated Milk After Cooking. Some recipes have you cook the pasta in milk. During testing, I found that the milk often scorched on the bottom of the pot. Cooking the pasta in water and then stirring in evaporated milk gives the best results. And why evaporated milk? Good question. The higher protein and fat content of evaporated milk lends a silky texture to the mac and cheese. For this recipe, skip low or no fat evaporated milk. Grate Your Own Cheese. Pre-grated cheese contains a starch to keep it from clumping. This starch causes a mac and cheese that’s a little dry and grainy. Skip it. Stir. Stir. STIR! Don’t add all the cheese at once. If you do, the temperature of the pasta can fall quickly and you’ll get clumpy mac and cheese. Instead, add the shredded cheese one handful at a time. Stir after each addition until the cheese is almost fully melted. Once that happens, add another handful. Repeat until all the cheese is added. Remove from the Heat. Sometimes it’s easy to forget that there’s a cooking plate under the insert of the pressure cooker. Like a traditional electric burner, this plate stays hot for a little while after cooking. That heat can cause the mac and cheese to overcook and get grainy. To prevent overcooking, remove the instant pot insert after you’ve added all the cheese. That’s really all there is to it. If you’ve ever tried to make a mac and cheese by just dumping milk and cheese together with pasta, you know that you usually get a gloppy mess. 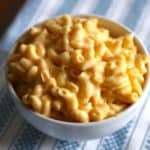 Traditional mac and cheese usually starts with a roux–a combination of cooked flour and butter. Recipes that don’t use a roux tend to use cornstarch. You don’t need either with this recipe thanks in part to two things: the starch in the pasta cooking water and the evaporated milk. Since the pasta cooks in a relatively small amount of water, there’s concentrated starch in the water remaining after the pasta cooks. This is key. Don’t drain that water. The starch it contains is what makes such a creamy mac and cheese. The other key? Evaporated milk. While you might be tempted to swap the evaporated milk for whole milk, don’t do it. Evaporated milk contains 60% less water than regular milk. This reduction of water means that one cup of evaporated milk contains more protein than one cup of traditional milk. The milk protein makes it possible to make a mac and cheese without starting with a roux. In only a few minutes, with just a few ingredients, you can make a mac and cheese that’s perfect as a main course or side dish. My advice: get out the stretchy pants and make this recipe. 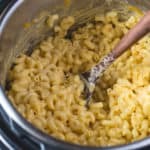 4 Ingredient Instant Pot Mac and Cheese contains elbow macaroni, butter, evaporated milk, and Cheddar cheese. It makes a creamy mac and cheese that everyone will love. 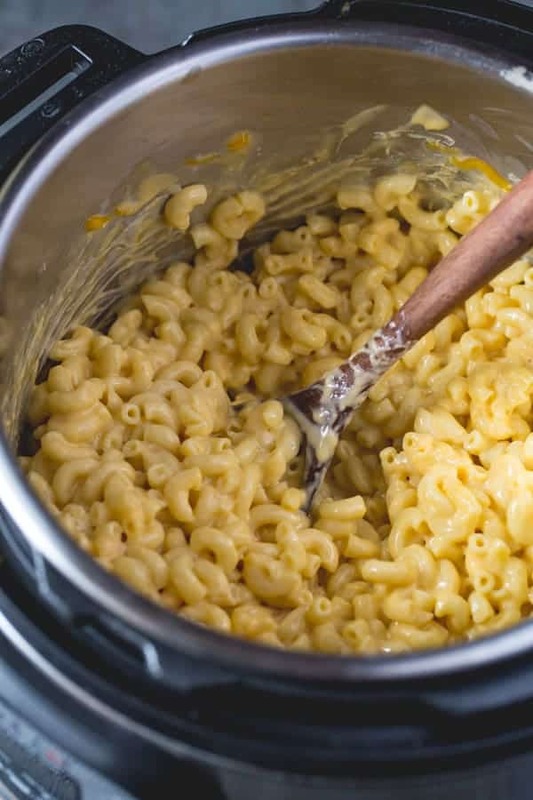 Combine macaroni, water, and salt in the pot of a pressure cooker. Stir. Add butter. Lock lid into place. Set pressure cooking time for 4 minutes on HIGH pressure. 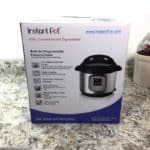 Once cooking time completes, allow pressure cooker to cool for one minute. Carefully vent valve to release pressure. Remove lid away from your face to prevent burns. Taste. Adjust salt and add freshly ground pepper to taste. You really want to grate your own cheese for this recipe. Pre-grated cheese is coated in a starch that can make this recipe dry, clumpy, and a little grainy. Sharp Cheddar is the best; extra-sharp, which I love, tends to be a little too dry for this recipe. Can this be doubled or tripled in the same pot? Or would I need to make separate batches and combine? It depends on the size of your pressure cooker. You never want to fill it more than halfway. 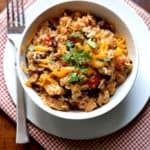 I have tried so many M&C recipes looking for THE one and this is it! It is fast, easy, and delicious! One of my toddlers had 3 servings. I used whole grain shells because those are my oldest’s favorite shape pasta and it still worked out really well. Thank you for this recipe! What kind of cheese do you use? Sharp or medium cheddar? Did you use low pressure or high pressure? I live at an elevation of 6,500 so it takes longer for water to boil so I sometimes use the low pressure instead of high pressure. The easiest Mac & Cheese I have ever made and one of the better tasting recipes. Turned out perfect. Mine turned out way to watery? Noodles seemed perfect but way to much water? Any suggestions? What type of noodles did you use? That really affects the texture. Trying it out tonight, it has all the ingredients that I have in my kitchen. No need to run to the store.